A gloominess hangs in our household whenever it’s wintertime without snow. You know what I’m talking about. Whether it fits with the historical record or not, my expectation is that the cold and snow should be here in December. Last week the mood here was glum. 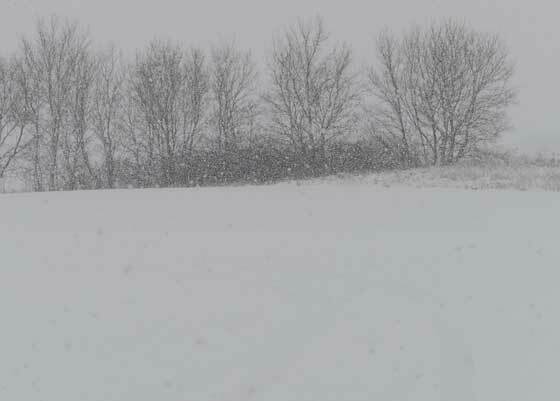 No doubt the combination of last winter’s lameness and an unseasonably warm November was the source of an edginess that sliced into what should have been good days, sowing the seeds of doubt. Will this winter be brown? Will my children ever experience the kind of shut-down-the-region-snowstorm that seemed to define the winters of my youth? Is global warming real and here to stay? I wasn’t the only one at my house with a heavy heart. My kids had been surly for what seemed like weeks. And each day after school they slumped into the house with an almost monotonous snarl, with little interest in playing outside. As a third-grade school teacher, my wife talks about the up-and-down movements of mood among their classes during the year, as if all the kids are on a similar wavelength that can range from high to low. For the past few weeks the overall mood was at the bottom of the spectrum. So jaded we’ve felt at weather forecasts that missed their calls for snow that, last Tuesday while watching the evening news, we barely put stock in the computer models and talking heads that suggested the white stuff would come at week’s end. "It will probably be rain," was me default refrain. On Wednesday the click of the bookmarked weather site on my computer brought with it a raised eyebrow and the flicker of raised hope: The chance of light snow increased to 40 percent for Friday, with the possibility of something bigger on the weekend. Another click later that day showed the percentage increasing. Could it be true? Just in case, I threw a couple empty 5-gallon gas cans in the back of the pickup to fill when I went into town on Friday. And when I tucked the kids into bed that night, both asked if the snow was coming. “I hope so,” was all I allowed myself to believe. Friday our family arose from slumber the same as we did the few days prior, although our dog Bella seemed to have an extra zip in her sprint for the breakfast bowl of Purina. I’m convinced animals (and some people) can sense swings in barometric pressure, which had surely occurred during the previous handful of hours. Around Noon the grey skies began dropping light flakes... a promising development. 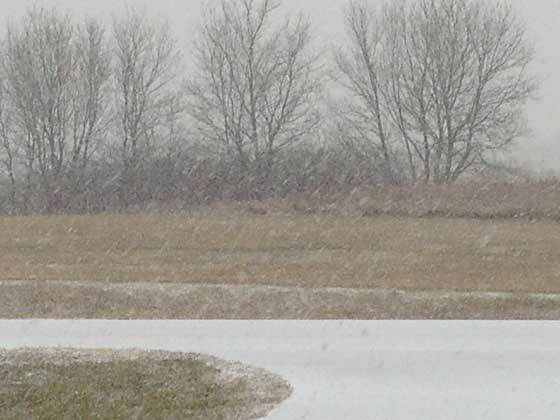 An hour later, the small flakes had turned larger. Soon the shelter belt of trees across the street from my office window had blurred behind the wintry mix. I wouldn’t know it until later that evening when we were sharing our revelations of the day, but at that moment inside my wife’s classroom, 26 kids had their faces pressed hard against the window while their legs, arms and voices signaled the arrival of nature’s greatest transformer of the human spirit. Little else academically was accomplished the rest of that day, to which the teachers could only smile knowingly. The one inch of snow that fell on Friday was just a primer for the blizzard that blanketed us two days later. Likewise, the excitement that filled area classrooms on Friday were tame compared to the screams of joy that echoed through neighborhoods on Sunday as snowballs were thrown, snowmen conjured and snowmobiles rumbled to life. The gloominess and doldrums that had defined the previous three weeks had been instantly covered by a blanket of joy. It was, in a word, transformational. 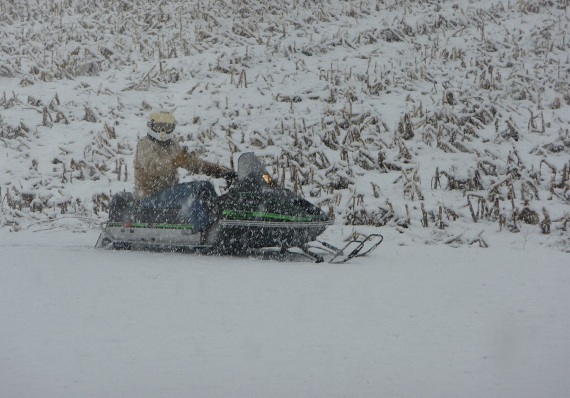 For children and snowmobilers alike, there is no weather event that so completely (and quickly) transforms us as snow. Snow brings instant, transformative joy and optimism. I realize there are many of you reading this who have yet to experience this season’s snow storms, and it might be impossible for you to know the conviction in my heart. But this I know: the snow is coming. And it will transform you. On friday, the trees in the shelter belt across the street from my office were blurred from the first snow that fell during the weekend. Little did we know what this would look like 48 hours later. 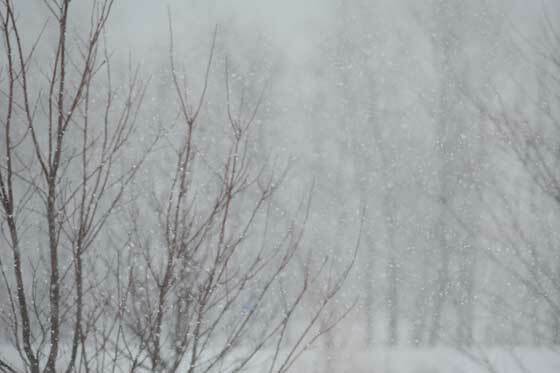 I realized something during this snowfall: That I like the grey, hazy view of snow falling even more than the bright blue skies that often occur a day after a big storm. There's something more evocative and moody about the grayness. Our family played outside most of the day during Sunday's snow storm, going inside only to eat and get dry gloves. 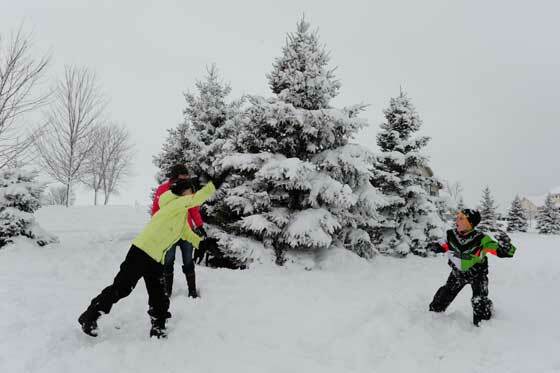 We're a family that plays together quite frequently, but there's something extra joyful about playing in the snow. 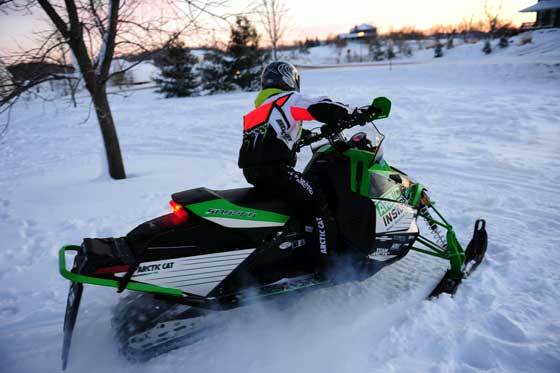 Arctic Cat fan David Hagemann sent this photo of himself that was taken last Sunday at his farm in Wisconsin. It's funny...even though he's wearing a full-face helmet, you can just see by his posture that he's smiling. Seriously. 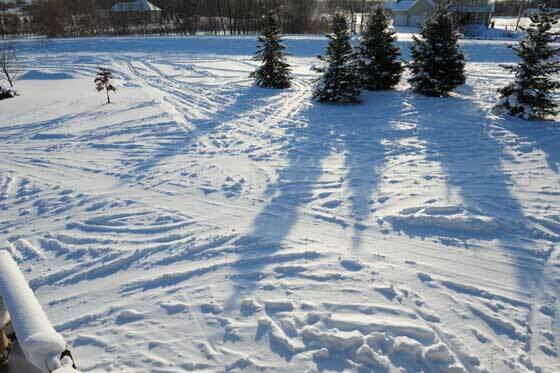 On Monday, the day after the blizzard, I snapped this shot of the backyard. Evidence of a transformational day. When my son Cal came home from school on Monday, the first words out of his mouth were, "Can I go snwomobiling?" For sure, Cal. For sure! And so officially begins our winter. It's my sincerest hope that your first real snow was/will be as transformational as ours. Truer words could not be spoken. I felt as if you could have been describing a scene from our own house and our kids. You have a gift of bringing winter to life and I'm very grateful that you are amongst us in the Arctic Cat family. We were driving home on I-94 in Sunday's blizzard. Top speed all of 35 MPH briefly. Wife and three kids in the back seat, glued to the window as the heavy snow fell. Our oldest son imagining he was riding the ditch on his sled. At that moment when winters haters decide to head south it felt cozy being encircled in the snow. Peace full. I just really wanted to say thank you for all you do for us Arctic Cat faithful. 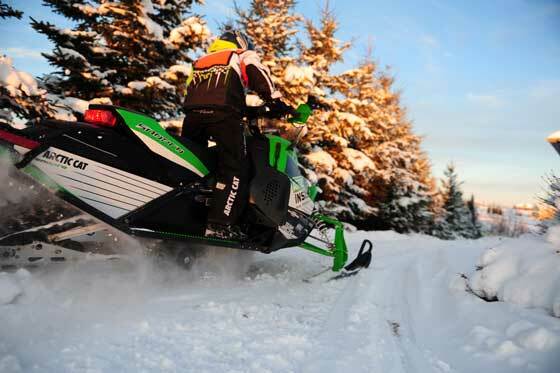 The interviews, articles, tech info, and story's that bring Arctic Cat to life. I'm convinced that no other manufacturer of snowmobiles has such a loyal almost religious following as Arctic Cat and you help contribute so much to that. Thank you kindly. I have to agree with MN Cat...big thanks to you John! Super-nice of you both to say that. I get a huge charge out of being among the Arctic Cat faithful, where I truly feel like family. Likewise I feel lucky that I have a place to share the stories. Lot's more great stuff in the cooker... I just need to figure out how to write faster! Thanks John. After i read this i had to look out and see if it was snowing! great story.... really enjoyed it and only know after having a child of my own can i say how nice it is to get outside and just play around with the family. As usual you hit it on the head. Ever since I can remember falling snow along with a nice white blanket on the ground makes winter lovers happy. If we had tails they would wag as the white gold falls from the sky. Ever since I was able to purchase my own Arctic Cat with my own $ in 1992 an EXT special of the same year. Myself along with a close cousin and any other riders that could get away from work would take a trip north seeking snow and open trails before Christmas. This was before you could search the internet for such locations and relied on information from making phone calls to resorts or hotels/motels for such intel. One year in particular stands out in my memory as being a quest to ride. After making numerous phone calls in our quest for snow,we had finally struck the jackpot. So the destination was Duluth/Superior and off we were,two trucks five riders and smiles from ear to ear. After the long drive from the Milwaukee area to our destination the smiles turned to frowns and a tear or two. After regaining control of the group that wanted to turn around and quit,I said we drove all this way,and if your sled was on my four place trailer behind my Bronco it was going north until we found what we were looking for. So onward we went and low and behold the further we went it started to get white,and the frowns slowly turned upside down into smiles:) our final destination was Eveleth Minnesota where we were welcomed to 8-12 inches of what we were looking for,we struck gold!! After finding lodging we checked in,unloaded the sleds and began our quest. We got maps,asked the usual questions and began a snowmobiling adventure that turned out to be one of exploration,excitement and verbage that was new to us. One that I will never forget was (are you all riding them there snow machines out there?) And the other one was of a top secret location where snow machine testing and experimentation was going on. We were told YOU WANT TO STAY AWAY FROM THERE FOR IT IS SURROUNDED BY HIGH BARBED WIRE FENCES WITH GUARDS. Well low and behold that just happened to be the location of Gerald Karpiks shop known as FAST so again we struck gold. Anyway we had the time of our lives on this before Christmas trip,that we had open trails all to ourselves,no groomers out yet and at one point while I was trail boss I noticed that the sign I just blew buy said International Falls 56 miles. So we put on about 420 miles or so in 3 days of riding,exploring and being lost. But when you are young you are only lost if you are out of gas. So this unforgettable adventure popped back in to my mind after reading Mr.Sandberg's article and I thank-you for that,and will have to dig up those pics and send them to you. Sorry John but I like King better than Jester. Only because you deserve the title. Think snow! One more thing and I will end this short story. I too wonder if my 9 year old nephew will be able to enjoy the snow of yeaster year. When he was 5 or 6 he was upset and got teary eyed when winter was over and the snow melted. I told him it will come back next winter and those tears turned into a smile. Great reading, Great Site you got here! My son says the same thing. We watch the WOBLE ride on SNOWTRAXTV at least once a month. Since we have no snow (just snirt) to ride on in the Thief River Falls area, I fired up the ATV after church last Sunday and went for a spin around "The Back Forty" at the farm. Same principle. Different machine. Enoying the great outdoors and having fun! A Very nice post . Every time i read your website i see a uinuqe view. In addtition , as a fresh developer, i need to say that the structure of your site is nice . Could you post some information regarding the theme ? . I find it hard to choose among all these themes and widgets. Cheers .